Before we can help someone with their sleep issue, we have to determine exactly what it is. 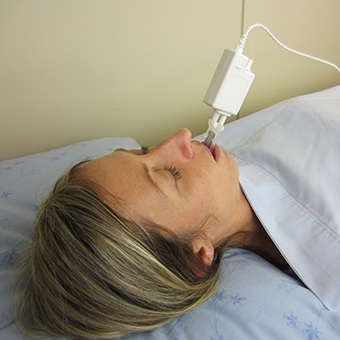 To do this, a patient must undergo a sleep study, which is a type of medical test. At Powell Dental Sleep Solutions, we can guide a patient through this important part of the process so they can get on the road to treatment as quickly as possible. That way, we can figure out the perfect solution to help them start sleeping better right away. Why Choose Powell Dental Sleep Solutions for Sleep Testing? ApneaStrip™ is also available, which is an easy to use, 100% disposable device that has prongs for both the nostrils and the mouth. 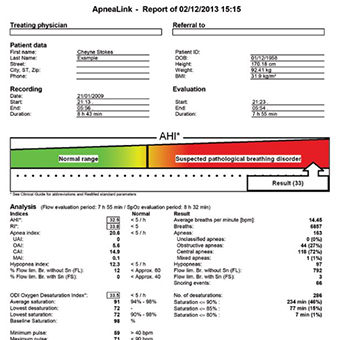 The patient must sleep with ApneaStrip in place for at least 4 hours upon activation. Upon waking, all you have to do is double click the activation button to see the results. A green flashing light indicates a low risk of sleep apnea while a red flashing light indicates a higher risk. Once we have these results in-hand, Dr. Shelley can recommend you to a local physician to confirm the results of the screening. 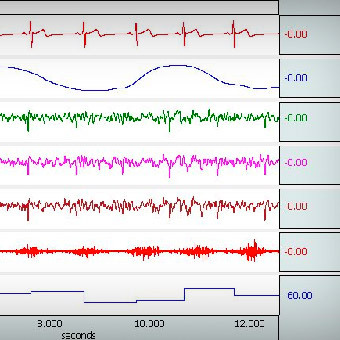 A sleep study is performed by a sleep medicine specialist during an overnight polysomnography at a sleep laboratory. This experience will identify how many times per hour you have insufficient breathing episodes. Additionally, this study allows a sleep physician to learn more about your brain, breathing, awakening, and movement activities during different sleep stages. 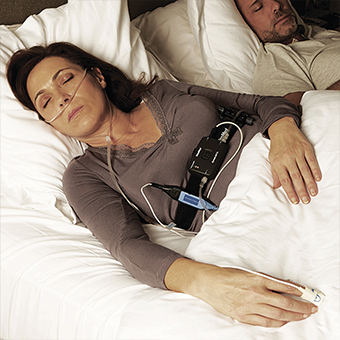 After baseline information is established and if you are presenting sleep apnea symptoms, the technician will determine if CPAP therapy should be tested that night or if you need to return for a longer time. If a minimum of 4 hours of sleep remains, the rest of the night will be spent adjusting the proper mask and air pressure to establish the most effective treatment. If you are unable to sleep, please inquire about the possibility for a dose of medication. A poor or short night of sleep does not provide accurate results for the clinician to be able to best calculate your treatment. 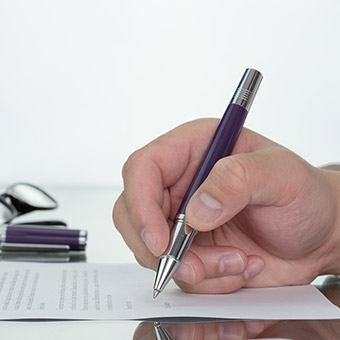 Once you have discussed your test results with your doctor, you should discuss treatment options. If your doctor agrees that oral appliance therapy is an appropriate option, they will provide your dental sleep medicine specialist with a prescription for the oral appliance. It is important that the collaboration between your physicians is an active partnership so it can deliver best care and results possible. If you do not have a sleep medicine physician, we can arrange a sleep study for you. MATRx device testing is the only clinically proven method to determine if you can be successfully treated with oral appliance therapy, an alternative obstructive sleep apnea (OSA) treatment. In a single night, you may know if you can be treated effectively with oral appliance therapy before actually committing to a treatment decision. Dr. Shelley can fabricate a temporary appliance for you to take to your overnight sleep study. The device gently advances your jaw during sleep, and the sleep technicians will be able to determine the effectiveness and best position for your jaw with oral appliance therapy. This system allows the expertise of both the sleep medicine physician and sleep dentist to identify patients who could benefit from oral appliance therapy. Dr. Shelley Shults is one of the few MATRx certified dental providers in Ohio. The Ohio Sleep Medicine Institute is the current provider for MATRx testing in the central Ohio area. A home sleep study may be determined as adequate by your sleep physician depending upon your initial evaluation and medical history. A home sleep study allows you to sleep in the comfort of your own bed, but it comes with limitations. A home study does not control for the position that you sleep while testing. Many times, one position can reveal worse problems with breathing than others. A home sleep study also does not record brain waves-- it records the entire time from when you first turn the machine on and until you turn it off. It is important to not begin recording until you are prepared to fall asleep. Achieving a minimum of 4-5 hours of sleep is required to utilize the data. Apneas are usually worse when positioned on your back, so your physician may request that you attempt to achieve most of that night’s sleep on your back if possible. In order to have a diagnostic study, it is required that a sleep test is ordered by your medical doctor or sleep physician in addition to a face-to-face evaluation. Dentists are not permitted to order these tests for diagnostic purposes, but they can use them to determine the effectiveness of your appliance therapy. Following final calibration testing, you will be asked to return to see your sleep doctor for a final assessment. Calibration home sleep testing allows your dental sleep physician to gain information regarding how your oral appliance is affecting your sleep apnea. At Powell Dental Sleep Solutions, this testing is a complimentary service. The following video will assist you in understanding the application and use of the testing device. Prepare for sleep by turning off all electronics one hour prior to bedtime, minimizing blue light exposure. Turn the sleep device on when you think you will be sleeping within the next 10 minutes. You will return the device Powell Dental Sleep Solutions the following morning. You will be notified of the results within 3-5 days. This test does not serve as a final sleep study. You will be referred to your sleep physician, and your test results will be forwarded in order for your sleep physician to provide the final recommendations. Obstructive sleep apnea may not be legally diagnosed by a dentist, but by a sleep physician. Therefore, it is necessary that you need to see a sleep physician for the medical diagnosis of OSA. At that visit, the sleep physician will determine the appropriate type of testing specifically required to obtain an accurate diagnosis. Your sleep physician will also recommend the diagnosis & treatment you should receive. You sleep physician will then refer you to a qualified dental sleep apnea practitioner, such as Dr. Shelley Shults, as well as a prescription for your oral appliance, if indicated. Dr. Shelley Shults and your physician will collaborate on the best treatment for you. This video provides a visual demonstration of performing your home calibration sleep test. It is important that you are ready to fall asleep within a few minutes of activating the recorder. 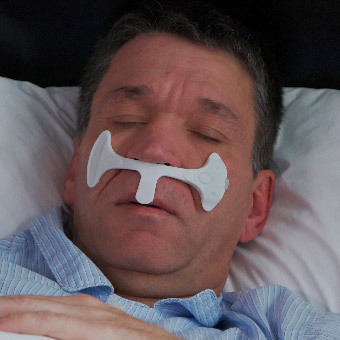 The nasal tube may be secured to your face with tape found in the kit. The device on your finger may also be secured if desired. It is best to attempt to record most of your sleep on your back unless you are unable to sleep comfortably in that position. If you should awaken during the night for a bathroom break, do not turn the device off. Return to bed as soon as possible. The device is recording while the light is on. When you awaken in the morning, turn the device off as soon as you are able. Return the device to our sleep dental office for evaluation of your sleep. If you are completing a two-night study, the batteries must be replaced between each night of recording.